In a small hamlet in northern Sweden nineteen people are brutally murdered. The local police are soon under enormous pressure to find the killer and bring him to justice, but clues are thin on the ground. Judge Birgitta Roslin feels compelled to visit the hamlet when she realises she is related to one of the couples killed. Using her legal insider status she gains privileged access to the investigation and soon picks up her own clues and pursues her own line of inquiry. She is particularly interested in an old family diary and red silk ribbon left at scene, neither of which the police seem to have any interest in. The ribbon eventually leads her to China and directly into the path of a powerful and highly politically-connected man who is prepared to stop at nothing to fulfil his ambition. 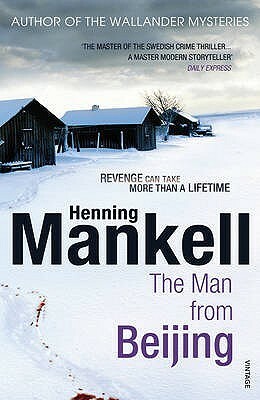 The title and the cover tagline (‘Revenge can take more than a lifetime’) neatly sum up in a few words the story that Henning Mankell spins out over 560 pages. The first section of the book is a typical Scandinavian police procedural and is enjoyable and quite gripping. But then the second section is set in China and Nevada in the mid-nineteenth century, the next in modern day China, then we visit East Africa, before heading back to China, Sweden and London. While the mid-nineteenth century story is interesting, what follows is a rambling tale that is more a partial political treatise than a thriller. Whole chunks of the material is overly descriptive and little move the story forward, there are a host of clunky plot devices, and bits of it make little sense, including why a very successful man from Beijing felt so compelled to murder 19 people for the way his ancestors were treated (not killed) more than a 130 years previously, and why a shooting in London is not investigated in any meaningful way. In effect, Mankell has jammed two stories together – a murder in Sweden by someone holding an inter-generational grudge and a political tale about in-fighting amongst China’s elite and its policy in Africa. Neither quite work on their own, let alone together. After a good start then, the book becomes increasingly flabby and, in my view, untenable. Which was a shame.